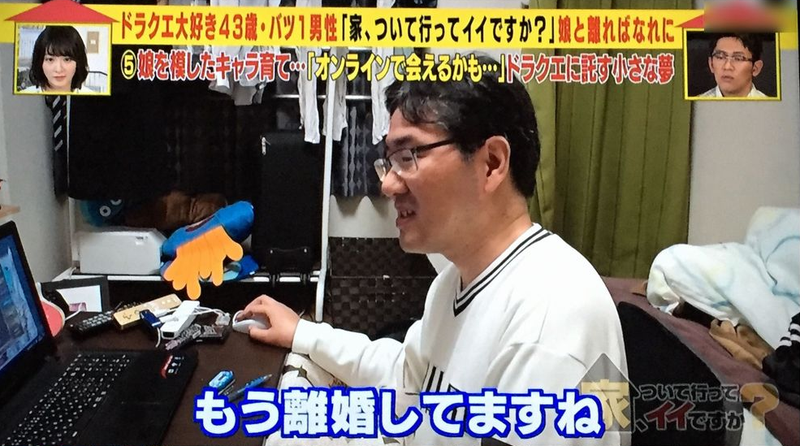 Recently on Japanese television, a 43 year-old systems engineer talked about his love of Dragon Quest and how it came between him and his family. TV show Ie, Tsuite Itte Ii Desuka? (“Is It Okay If We Follow You Home?”) stops random people on the street, asking to peek inside their abodes. On the most recent episode, a man who went by the name “Kaccho” was stopped in Nipponbashi (Osaka’s geek area) and agreed to let the show film inside his apartment. Images from the episode were posted on popular Japanese sites like 2ch, My Game News Flash, and Hachima. As soon as the cameraman stepped inside, he noticed that Kaccho had added an extra lock to his door. The reason, Kaccho said, was that he had previously been robbed—that someone had stolen his Metallic Slime PS4, his Dragon Quest emblazoned 3DS, and two tickets to a Dragon Quest concert. The cameraman then noticed how Kaccho’s apartment was filled with Dragon Quest goods—slippers, dishes, plush toys, key holders, figures, and more. Kaccho showed off photos he had taken with Dragon Quest developers, including series creator Yuji Horii. While talking about the two characters he plays in DQX, Kaccho explained that one of them was created after his 14 year-old daughter. He explained that he had gotten divorced four years earlier. “I used to look after my kid until I started gaming too much,” he said. While he can’t say for sure, Kaccho believes that his incessant Dragon Quest X playing caused his marriage to fall apart. He tried to get custody of his daughter, but lost. Kaccho said he doesn’t have his wife’s contact info anymore. Even though he still wants to see his daughter, he hasn’t tried that hard to get in touch by, for example, reaching out to his in-laws. “Are you happy about the divorce?” the cameraman asked him towards the end of the segment. Until then, Kaccho spends his time playing Dragon Quest X and leveling up her character.